Rambutan in Syrup from Chao Koh. Rambutan or 'Ngaow' in Thai, is one of the common known fruit with a hairy skin. Rambutan is a sweet and juicy white pulp. Once you try it, you will fall in love this fruit. Like others, Rambutan serves with ice, ice cream or by itself. For better taste, serve when it is cold. 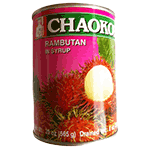 Ingredients: Rambutan, sugar, water. Product of Thailand.